As you know, we spend a significant amount of time outdoors. And the ticks are just terrible this year. After our last campout, I removed ten ticks between the five of us. It was nine days later when I saw Pierce scrambling up a ladder at the playground that I noticed a red rash on the back of his leg. A quite circular red rash. A rash that looked an awful lot like a bullseye. We were on the playground at the zoo at the time, in the middle of Pierce's school field trip. I'd been chaperoning Pierce and a classmate for the day, and exhaustion was starting to set in. As I examined the odd rash, I confess that my first thought was an internal groan over having to rush off to the pediatrician's office after such a busy day, when all I wanted to do was sink into the couch and pretend for 30 minutes that there wasn't dinner to cook and sippys to fill and lunches to pack. Instead, I consulted two other moms on the playground, both of whom agreed that I should get it looked at. Then I called the pediatrician's office and was able to work us into the last appointment of the day. They were running behind, so we weren't even seen until after the office had closed for the day. But it was worth the wait. The pediatrician studied the rash at length. It was ambiguous - definitely not your textbook case. However, there was a defined arc on half of it, and the doctor felt that he could see a faint arc around the other side. This bullseye is the hallmark of lyme disease. The picture doesn't quite do it justice, but you can see the inflammed red area in the center, and the less defined arc around the edges. The key in lyme disease is receiving early treatment. The pediatrician gave me 3 options. Wait for 24 hours to see what happened. Do bloodwork (which he said is unreliable for lyme disease, especially just 9 days out, and would subject Pierce to a blood draw). Go ahead and treat him for lyme disease, which he felt like this looked like, albeit not textbook. And I'm going to try to be MUCH more vigilant about bug repellant for the boys. I'm going to treat it like sunscreen - a must have in the outdoors. I don't like the toxins in most bug repellants, which is why we haven't been using them, but last year at Type A Con I got samples of Bug Bandit which doesn't contain Deet or other harmful chemicals. I dug it out and I admit that the smell is not unpleasant and I feel like this is something I could use on a daily basis without feeling guilt - it's nontoxic and natural. I don't know how well it works for repelling ticks yet, but we're going to put it to the test! (On a side note, Fairy Tales doesn't know I'm talking about their product - I'm not mentioning it for PR purposes but because I like it and thought you all might be looking for similar products for your kids). For now, we will make sure the antibiotic is working well, which it should be assuming the rash doesn't spread at all (and it hasn't - it has receeded with treatment). I will also keep a sharp eye on the twins (who also had ticks removed) for any signs of a rash. I feel fortunate to have been in a place to notice the rash on Pierce when I did. Lyme disease includes troubling symptoms - including severe joint pain, heart issues, and neurological problems. It's not something anyone would want their child to face. Oh, sorry to hear that for Pierce. Hopefully its still just some oddball rash but its smart to be safe. In my small office of 12 or so, 4 of them have gotten Lyme. 2 had serious medical problems. I've changed where I run now because of it. No more winging it through the woods. Here's wishing Pierce a speedy recovery! Oh my! Luckily you caught in time, and I would have opted for the treatment as well. We use an organic bug repellent, but I am not at all consistent about putting it on. Oh, scary! I'm so glad you noticed it when you did and, for what it's worth, I definitely think you made the right decision. Yikes! We live just minutes from LYME, where it all started. The ticks are terrible here too... and ticks are gonna happen no matter how diligent we are with repellents, atleast that's what I've found. I think you were very wise to start the antibiotic... as you stated... early treatment is key. I so need to be better with this with my guy. The small bugs are eating him alive. oh no, glad you caught it early on!! Oh my! Saying lots of prayers for Pierce. I went to the website for the bugstuff and was thrilled to read it has the same ingredients as a spray I used to get to keep fleas and ticks off our dogs. I haven't been able to find that spray for a couple of years, so I was so happy to get this link. I ordered 3 bottles. My husband has cancer, and we have removed all chemicals from our home and diet. I had worried about what we should do for an insect repellant, so you helped us out for that as well. If this stuff works, I am going to order it 10 bottles at a time. With 2 big dogs and lots of outdoor projects for us, we will go through a lot. So nice that this product is really cheap!!! Oh lisa i hope he gets better soon. Please keep me updated! Good catch, Mom! Lymes is, indeed, very scary. I'm grateful you found it so quickly and that the Dr. was willing to treat it. Prayers out to Pierce. How fortunate you found the rash when you did. Scary stuff. Thanks for posting a picture of his rash! I'm glad you saw it! Our whole family had tick bites a couple summers ago, and I was so worried about lyme disease. 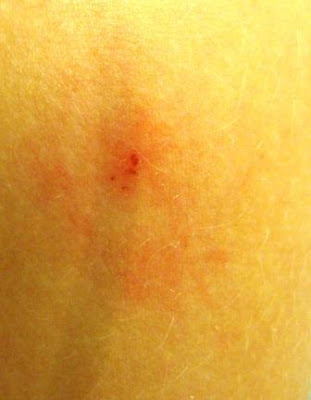 I even was able to bring in a tick for the doctor to look at, and she said it was a deer tick. Fortunately, none of us were infected. You are so right about the ticks being horrible this year. I've seen them actually crawling on my dog's nose when she came in from the backyard. They don't attach because the dogs get monthly flea and tick meds, but still I have to check them sometimes to make sure they are not bringing ticks into the house. I had one attach to me about a month ago on my leg. Noticed it when I got ready to take my shower that day and so I pulled it off. It took forever for the sore to heal, but no signs of lyme disease or the arc. All you can do is what you are doing, Lisa.. just be vigilant and hope we get a colder winter this coming December to kill the bugs off. II am so sorry to hear. If you need any advice, please let me know. I had Lyme disease two times and was hospitalized both times. I can give you any information you need. Just feel free to reach out. Good for you! The ticks are dreadful and I'd make the same decision about the antibiotics. The long run effects of Lyme--esp. untreated--are horrific. And this post is a good reminder about prevention. Good decision to go for the antibiotics. I have so been there when the last thing I want to do is take a kid to the hospital because they are sick or hurt! I'm going to look for that bug spray for sure. Thanks for the mention! Lyme scares the everlovingcrap out of me.... Espeically since that bullseye doesn't always happen! Keeping my fingers crossed for you guys. The antibiotics early are so key. wow that is really scary. I would have totally done the same thing and put my child on the amox also. I never put bug spray on my kids either, I wonder if I should start. Its just hard enough to get sunblock on them half the time... have you ever heard of the combo sunblocks and bug sprays? Poor Pierce! Lymes disease can be scary. I also can't stand ticks. When we lived in WI we dealt with them and it was horrible. I actually got Lymes disease. I was visiting my parents and on the drive home I saw these red rashes on my arms and I had flu like symptoms. Went to the doctor the next day and the doctor said I had it as soon as he saw me. I was really scared! I'm just thankful it wasn't Hailey (who was a baby at the time) and that the medicine cleared it up. You did the right thing, Lisa... the ticks were thick about a month ago, but the dry weather lately seems to have banished them from wherever they came. Wishing Pierce a speedy recovery. Ticks scare the B Jeepers out of me. I know you hate to give him antibiotics, but they can be good sometimes. Just give him probiotics too! oh, lisa! so glad you caught this when you did and went right to the doctor! i know a woman who is afflicted w/ lyme disease. really terrible for her - for the rest of her life! I think you made a good decision. I would have done the same! The ticks are awful this year. I already removed one from Lexie's neck! I had never seen a tick before in my life until last summer, when I got one, followed by Dylan getting two! Great reminder about the bug repellent. I hope it clears up soon. Sending prayers his way! So sorry about Pierce, but so glad you caught it early. I hope everything clears up very soon without any problems. Thank you for sharing this--it's a timely reminder for all of us. Bless his heart, Lyme Disease not good for sure. I hope the rash dissappears.it was a tough decision, I use Repel spray on my clothes and a topical spray on my skin.I have had 2 connect and many loose ones myself. Oh, no!! I'm always worried about ticks when we visit my parents - they live in a heavily wooded area. I hope he likes yogurt, to help protect his tummy deal with the gastrointestinal effects of the antibiotics! Oh poor Pierce, that is no fun. Try yogart to help keep his natural body antibodies in balance. Being on antibiotics that long can sometimes cause yeast infections (in the mouth or warm moist crevases)and it will help fight that. Oh gosh, sorry to hear that! I hope he's doing well with the antibiotics. Poor Pierce! I have a girlfriend that had lyme disease years ago and she still suffers from side effects. Good thing you caught it soon on Pierce. Thank goodness you spotted it- and got right in to see the doc. Lyme Disease is so scary. Poor Pierce, but you did the right thing Lisa! A friend of mine's husband had Lyme disease and he was very, very sick. Ticks are a big problem here too-we have to keep the dogs on Frontline, but even so, the ticks drop off and we find them in the house. Ticks are such nasty horrible things! Unfortunately, they are part of summer. I'm definitely going to check out Bug Bandit. Stuart and Amy are headed to Maryland in a couple weeks and ticks are even worse there. Oh no! I'm glad you got him checked right away. I'm always so freaked about ticks at this time of year. Argh!!! Hope all goes OK! You absolutely took the right option; the first two didn't even make sense to me. I hope it clears up real soon! I was never an antibiotic Momma either, but I would've made the same decision in Pierce's case. It wouldn't be worth the change of him suffering the permenant effects of the Lyme's disease. I certainly didn't know that you had this much trouble with ticks there. My gosh, I'd probably be in panic mode worrying about it all the time. I'm sure I would have done the antibiotics in this case too! Oh Lisa! So glad you found it and decided to take him in...even if it wasn't textbook, it's better to be safe than sorry. Sorry to hear about your baby. I sure hope it clears up fast with no lasting effects. So glad you caught it in time!! Oh my! I'm sure glad that you took the advice and got Pierce checked out. Lyme Disease is very scary and it's better to be safe than sorry. Keep us updated. I will be praying for your little boys, for Pierce that he gets well and the twins- that they don't get rashes. How scary, Lisa!!! I would have done the antibiotic treatment too. Hope the bug repellant works well for you. I know there are some without DEET in them, but I don't know how well they work for ticks. Hi Lisa, You are definitely doing the right thing... Hope it's not Lyme Disease---but you are doing what you need to do now. I'll keep Pierce in my prayers ---and YOU! I keep reading about how bad the ticks are this summer... Bug Spray is as important as Sun Screen..... It's good to keep getting the word out. Ugh! So sorry, Lisa. I hope Pierce feels better soon. Hit him with some Culturelle for Kids after the antibiotics run their course to restore the good bacteria to his intestines, as well as plain yogurt and kefir (smoothies!). 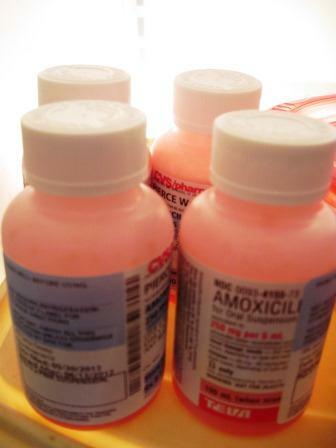 I hate antibiotics but would do the same thing for my kids - you made the right decision. Also, even though he may have been bitten away from home, guineas are great for tick control. We haven't found many on ourselves this year. Thank God you noticed it. Praying that you caught it all in time and that the antibiotics work. I am going to buy some of that product since we will be in the woods for a week in July. Oh Lisa, I'm so sorry! I would have done the treatment too, but I'll pray that it's not Lyme disease and that if it is that you've caught it soon enough that he won't have all the difficulty with it. Hugs! When our daughter was about 8 years old, she had severe knee pain that would wake her up in the middle of the night. Doctors kept saying it was "growing pains". After a month of that, I got frustrated so we switched doctors. She had lymes disease and to this day, nobody ever saw or found the bulls eye on her. She had two months of treatment to get rid of it. Talk about scary. Glad you caught it in time and taking precautions!